"I don't want to get shot, man!" Three friends from New York City travel to the woods of Delaware for a lazy day of hunting and beer drinking. After interminable wandering and very little of anything happening for some time, danger suddenly comes a-callin' and rains down all sorts of death on the trio. That's Trigger Man in a nutshell, and it is tagged with the dreaded "inspired by true events," which at some point I thought simply meant it was referring three guys stumbling around the woods not saying much to one another. Writer/director Ti West achieved some moderate horror genre notoriety with the vampire-bats-gone-wrong in The Roost, and he's getting a big break helming the upcoming Cabin Fever sequel. And sitting smack between those two projects is Trigger Man, West's extremely shaky camera lurch into the realm of hunters becoming the hunted. Even at just 80 minutes, this one seems woefully padded with unnecessary sequences, such as early on when we follow a character on his walk to buy cigarettes, which I was convinced was some clever foreshadowing moment that would figure into the climax. Nope, just a pointlessly overlong scene of a guy buying cigarettes. Ditto for all the walking in the woods scenes, too. As an exercise in verite minimalism, Trigger Man operates on a very slim margin. The constant zooming in and out, in conjunction with the general handheld shakiness, becomes a little much, and is nearly dizzying. And not in a good way, mind you. Dialogue is sparse—rarely anything other than small talk—and by the time it hits the halfway point, the film essentially becomes a dialogue-free survival story, as West boldly moves beyond the danger of the deep woods and into an equally menacing location. From a visual standpoint, both of these locations are effectively menacing—especially during the last twenty minutes—but West fails to deliver a story that brings together anything other than the most base elements. I barely knew or cared about the leads at all, and the resolution to who's doing the human hunting was largely uneventful. All is not wholly rotten with Trigger Man, it's just not quite the "jolting" "stunning" "nail-biter" the back cover promises. The three main characters all move and speak like real people, and the wee bits of dialogue carry a natural, spontaneous flow. West does show some quick bursts of applying palpable tension, as when a lone jogger gets in-between the hunter and hunted, but it isn't enough to make up for the other 75 minutes. And there is an intriguing concept at work here, one that West somehow doesn't seem to have all of the answers for. 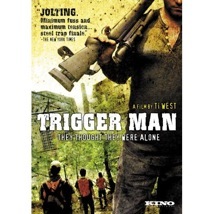 Image Transfer Review: Trigger Man comes from Kino in 1.85:1 anamorphic widescreen. The print is fairly clean, yet because this one was shot on the cheap, the transfer can't do much to remedy that. Edges are quiet soft throughout, while colors play somewhat drab. A few facial closeups fare better in revealing details, but overall this one lacks any substantial pop. Audio Transfer Review: Audio options are available in both 2.0 stereo and 5.1 stereo surround. Not much in the way of any sweeping surround activity, and the spartan dialogue is sometimes overshadowed by ambient "nature" sounds. Ironically, that's what works here, as sound designer Graham Reznick pushes those real world noises to the front, creating an au natural suspenseful audio layer as a method to increase tension. Extras Review: Extras consist of a pair of audio commentaries—the first from writer/director Ti West and sound designer Graham Reznick, while the second has the main cast of Reggie Cunningham, Ray Sullivan and Sean Reid. Given the extreme minimalism of the film, that seems like a bit of overkill, and of the two the West/Reznick track carries the most salient content about the low-budget production. Neither of the tracks are particularly riveting, but a few anecdotes—such as retrieving a stunt dummy after its fall—are amusing in some weird way. Also included is the film's theatrical trailer and a poorly miked Q & A From The Los Angeles Film Festival (15m:09s), recorded in June 2007. West leads the charge, fielding hard to hear questions from the audience, and actor Reggie Cunningham appears to have had a few too many libations. Trigger Man is a short film idea pushed to barely feature-length proportions. The few genuine moments of suspense are stretched between long passages of nothingness, apparently meant to heighten the impending danger. The abrupt locale switch for the final act is a nice touch, but writer/director Ti West's purposeful ambiguity on the plot side is simply aggravating.